Former City regulator Adair Turner has warned that without radical policies, the UK economy could be stuck with low interest rates "almost indefinitely". He told the BBC "interest rates in the UK may not go up beyond 2% by 2020". The Bank of England's rate has been at the record low of 0.5% since March 2009. Lord Turner also warned about the dangers of peer-to-peer lending, which matches individual borrowers with lenders using online services. Peer-to-peer lending is one of the fastest-growing areas of financial services, which appeals to borrowers who have been turned down by High Street banks and savers prepared to take greater risks to make bigger returns. "The losses which will emerge from peer-to-peer lending over the next five to 10 years will make the worst bankers look like lending geniuses," he predicted. "You cannot lend money to small and medium sized enterprises without someone doing good credit underwriting." He said proper checks were required to ensure a company actually possessed the premises, equipment and expertise it claimed. He said advertising for the lenders should have clear warnings and only people who can afford to lose their money should take part. "This idea that you can automate that on to a platform, it has a role to play, but it will end up producing big losses," he said. But Christine Farnish, independent chair of the P2PFA, the industry body representing peer-to-peer lending, said Mr Turner's comments "fly in the face of the evidence". "Since the industry began, default on loans are low, measuring between 2-3%," she said. "We only lend to creditworthy consumers and established small and medium-sized enterprises. Strict credit underwriting rules apply to all our members and this should not be confused with higher-risk forms of crowdfunding or lending to sub-prime customers," she said. Lord Turner also said that the possibility of the UK leaving the European Union "would be adverse for the UK economy" and was already "causing major destabilisation at a global level". "There is a great deal of nervousness that a UK vote for Brexit [to leave the EU] is another layer of uncertainty in an extremely uncertain world - uncertain economically and uncertain politically." It comes less than a week after Bank of England deputy governor Ben Broadbent told BBC Radio 5 live that the expected referendum was not yet causing problems for the UK economy. "We have not yet seen, regarding investment intentions, any weakening of those of late, but obviously it's something we watch pretty closely," he said. 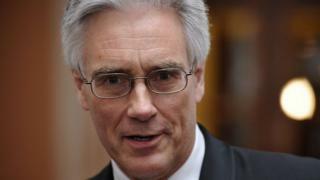 Lord Turner was chair of the Financial Services Authority until its abolition in 2013. You can hear more of his BBC interviews on Wake Up To Money and Radio 4's Today programme. Budget 2015: Will tax-free peer-to-peer lending get the go-ahead?